Mumbai, December 8: One of the Indian Navy’s pride, INS Sunayna, deployed on anti-piracy patrol in the Gulf of Aden, detected a suspicious fishing vessel, approximately 25 nm off the coast of Somalia, in the vicinity of Socotra island on Friday. Council Resolution (UNSCR) 2383 (2017). 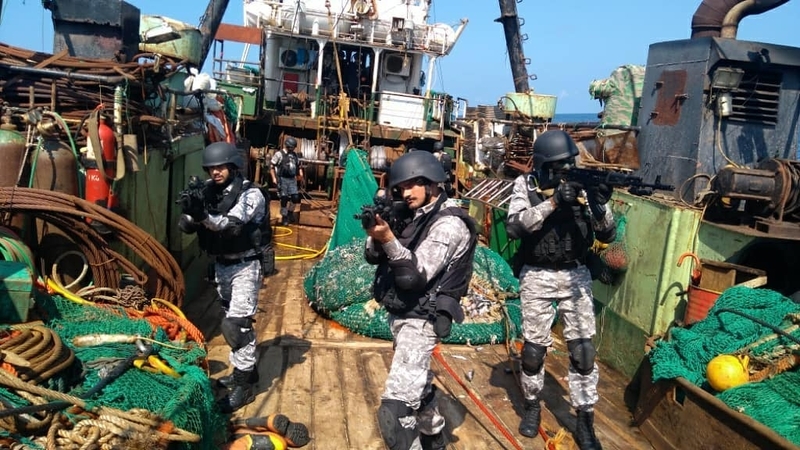 The vessel was thoroughly searched and allowed to proceed, after confiscation of the arms and ammunition, to prevent illegal use later by the crew for piracy-related activities. Last month, the ship, Sunayna, carried out the operation in which two high-caliber AK 47 and AKM rifles, as well as some ammunitions, were seized from a number of boats, approximately 400 nautical miles northeast of Mogadishu off the Somali coast, the Navy officials said. The ship was deployed for anti-piracy patrol in the Gulf of Aden since October 6. On November 9, the ship detected a few suspicious boats and later seized the arms and ammunition from them. The boats and crew were released post interrogation, the officials said.